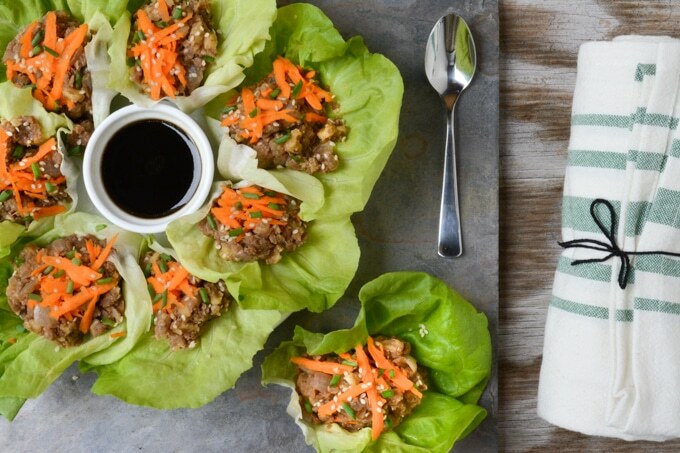 Asian-inspired vegan lettuce wraps are packed with a lentil-walnut “umami” filling. Serve these gluten-free wraps with a side of rice for a quick & simple lunch. Or enjoy them alone as a light snack. If you’re looking for a quick and easy meal I’ve got the perfect recipe for you! 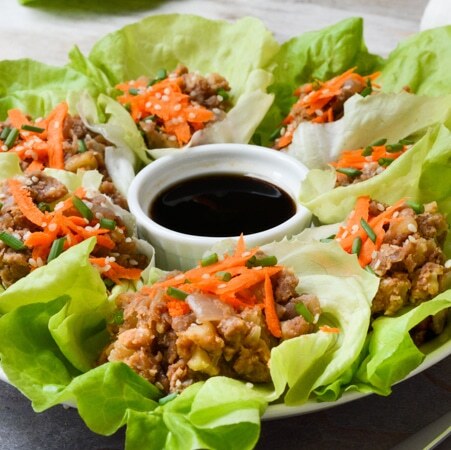 In addition to my chickpea salad, these lettuce wraps have been my new favorite go-to lunch! They’re super easy to bring together and ready in about 20 minutes. Plus, they’re just as delicious cold! 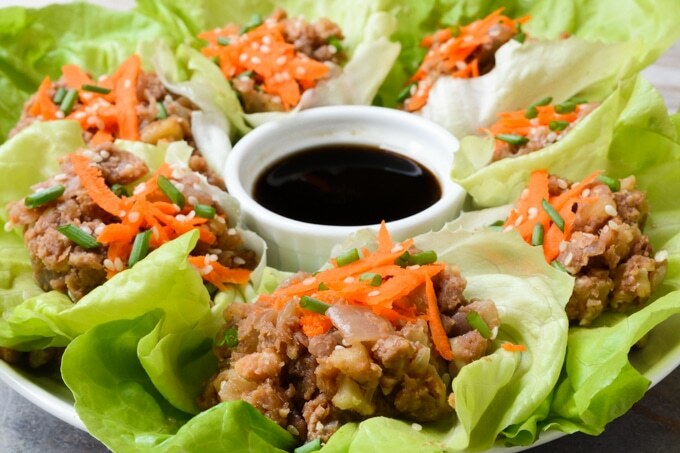 Butter lettuce leaves are filled with a lentil-walnut mix, then coated in an Asian-inspired sauce. Top these vegan lettuce wraps with shredded carrot, green onions and toasted sesame seeds and you’ve got a satisfying light meal. I’ve seriously been hooked on these things since the moment I tried them. 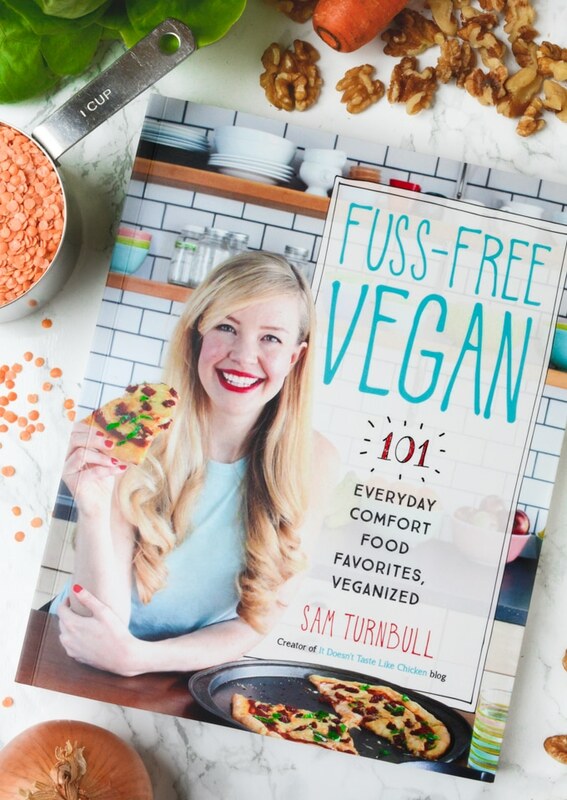 Sam Turnbull, creator of the blog It Doesn’t Taste Like Chicken, recently released her new cookbook— Fuss-Free Vegan: 101 Everyday Comfort Food Favorites, Veganized! There are 101 amazing recipes inside this book and they ALL live up to the name ‘Fuss-Free’! 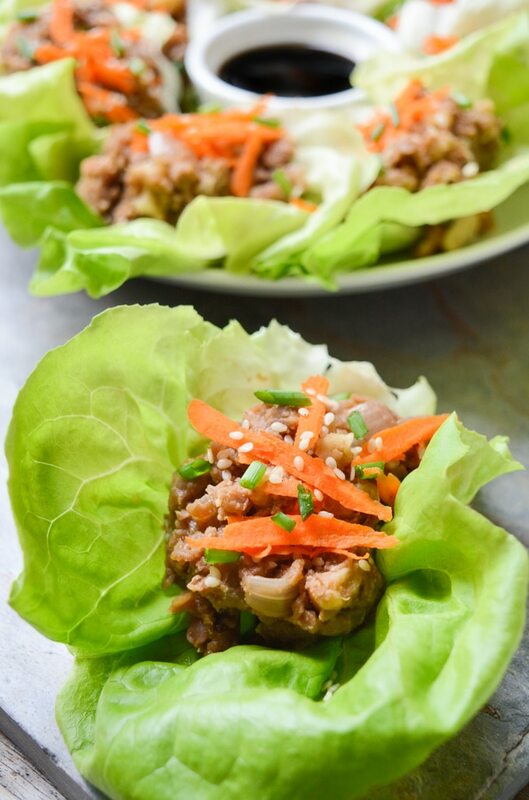 The Oh Mommy Umami Lettuce Wraps won me over instantly. They’re quick, easy, delicious and I always have the ingredients on hand! 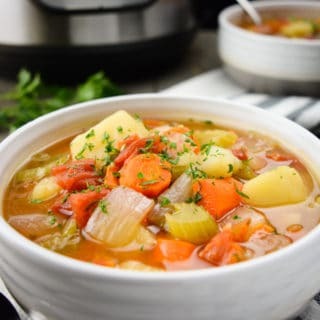 Sam was kind enough to allow me to share the recipe with you guys! So, be sure to grab yourself a copy of her book and give her other awesome recipes a try as well! Honestly, I think I could devour everything in this book! 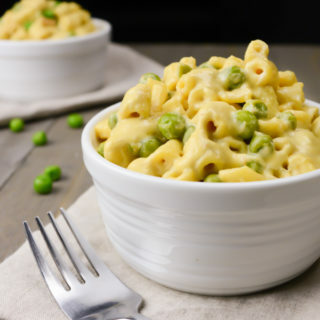 Fuss Free Vegan includes more than just easy-to-follow recipes. Sam has also included a list of vegan pantry staples, go-to kitchen tools, measurement conversions, and my favorite, a menu plan section. The menu plans are simple, special occasion, suggestions put together by Sam. 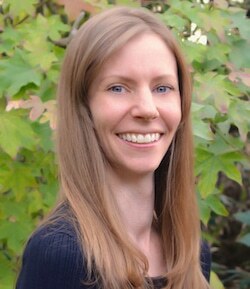 She has compiled recipes from the book, to make and serve at your next Summer BBQ, Date Night, Potluck, Birthday Party and more! Now, let’s make some vegan lettuce wraps! AND DONT FORGET TO GRAB YOURSELF A COPY OF FUSS-FREE VEGAN! 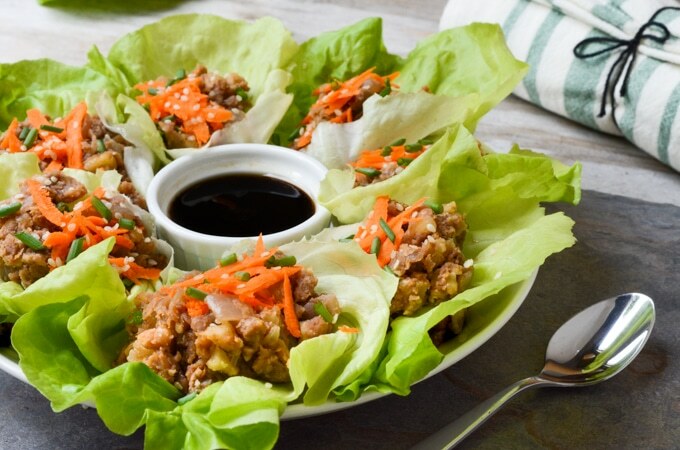 These Asian-inspired vegan lettuce wraps are an easy, packable light snack. Serve these gluten-free wraps with a side of rice for a quick & simple lunch. In a small bowl mix the ingredients together and set aside. Heat the oil in a frying pan over medium-high heat. When hot, add the garlic, onion and ginger and sauté for about 5 minute, until the onions softens and begins to brown. Stir in the lentils then the vegetable broth. Turn the heat to medium-low, cover, and simmer for about 10 minutes, until all the broth is absorbed and the lentils are cooked. Stir in the walnuts and about half of the sauce mixture, or to taste. Take a leaf of lettuce, fill it with the lentil walnut mixture, top with carrot, green onions, and sesame seeds and spoon as much sauce as desired over it all. Fold it like a taco and munch away! 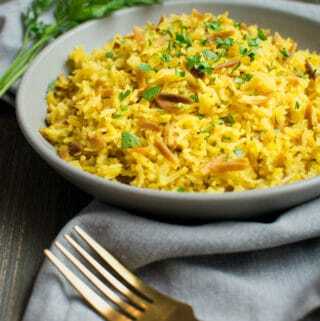 are the red lentils from a can or dry? Yes, I'm loving the book! Everything I've tried in it so far is a winner!